When you remove frames from the end of your scene, the exposed drawings and symbols are not deleted. If you extend your scene afterwards, these drawings and symbols are still available. You can quickly reduce your scene length in the Timeline view. 1. In the Timeline view, drag the scene length bracket to the left to remove frames from your scene. You can remove any selected frame in your Xsheet view, such as the last frame of your scene. 1. 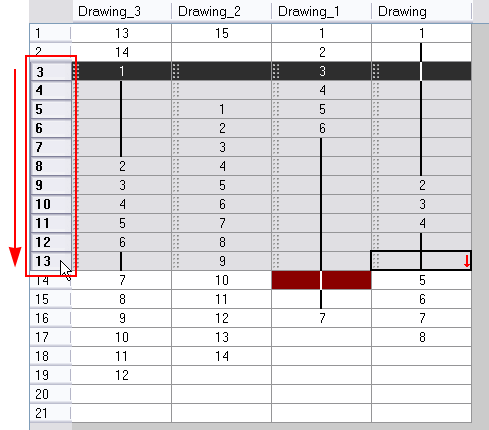 In the Xsheet view, select a frame in a given column. 2. In the Xsheet View toolbar, click the Remove Frames button. To remove several frames, click the button repeatedly. You can also select Scene > Frame > Remove Selected Frames from the top menu. In the Xsheet view, you can remove any selected frame range. 1. In the Xsheet view, select a frame range by clicking the first frame’s number and then dragging the selection highlight down to the last frame to delete. ‣ Press [Delete] to delete the selection. ‣ Click Remove Frames button. The Warning dialog box opens. ‣ Click No to only delete the exposure in the cell and not the frames.